A new year always leaves me reflecting on the prior. What did I love? Learn? For me, 2012 was a memorable one. This time last year, I had resigned at one dialysis company to take a new job closer to our old home in Ohio (and for more money) that allowed me to be at home more and spend more time on my other career as a college instructor. Looking back, I know that working in dialysis was not a fit for me — it was sad, sometimes very happy (how cool is it to see a patient get a kidney transplant? ), but in the end, not the right fit for me. Teaching, however, I thoroughly enjoyed. In so many ways, teaching “saved me” from an otherwise unfulfilled career, and yet, working in the dialysis clinics allowed me the flexibility in my schedule to piece together full-time work and left enough time for me to commit time to lesson planning, grading, and all the unforeseeable duties of a college instructor. My students, to this day, warm my heart. I hope I do/did their, as well. After a very brief 5 or so months at my new dialysis clinics, Mr. Prevention’s company called him up to Michigan. I had been anxiously awaiting this move as Michigan is closer to home and an area I absolutely adore. After a freakishly brief house hunt, we moved into the home that I lovingly tell Mr. Prevention we’ll grow old in together. Being so close to Lake Michigan is a luxury that I am thankful for every time I open a door to the outside. The sound of the lake in winter makes me hate the cold just a little less and the sound of jet skis in the summer makes me feel like I’m on a summer-long vacation. After our move-in, I started what I refer to as my “dream job”. Sometimes, things are meant to be and this job… I feel like it was made for me. My staff, the opportunity to work in management and with both food, menus and patients has been remarkable. I did nothing but scour the internet and take a shot-in-the-dark when applying…it has been an exciting chapter in my career. In the past 6 months I have been challenged and grown a lot as a professional and as a dietitian. This year (less than 2 weeks ago!) I sat for my Board Certification in Advanced Diabetes Management and while I don’t have the results yet, I am optimistic. At the very least, I learned a lot when studying. Despite the demands of life, I continued to make time for the things most important to me — I posted 322 blog posts in 2012, I am playing hockey nearly as much as I did as a collegiate athlete, and when people ask if I’m a good cook, I say with confidence, “Yes!”. After years of cooking up a storm, yes, I can cook! I blog from my living room floor with a snoring bulldog draped across my lap, photograph with a novice-level DSLR that has been broken since the week I got it (oops), and fight with Mr. Prevention to this day on whether or not he’ll enjoy another recipe made with a “weird” ingredient all while hearing, “Why can’t you make ‘normal’ food, Nicole?” on repeat. Some things never change, no matter what the year. This past July, I received a life-changing email with the subject, “Prevention RD Cookbook?”. Literally, my wildest, most far-out dream came together before my eyes and by August, I was writing a cookbook. My cookbook, A Delicious Balance: 100 Healthy Everyday Recipes from the Creator of Prevention RD is coming out in August (!). My editor is plowing through the edits now and it is absolutely surreal seeing my work on Amazon. I “get” that this happened/is happening, but it really hasn’t hit me yet. All I know is that I saw what the layout is going to look like and…I fell in love. What an opportunity to share with others all that I know and love about food and health. I am humbled and proud. Thank you! Ironically, one of the chapters in my cookbook I was challenged most by was “In a Bowl” — all things soup, chili, and stews. Other than my beefed up version of chicken noodle soup, I consult others for their soups and chilis. 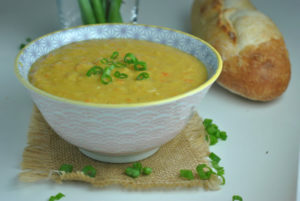 Lindsay’s is one of the blogs I go to where everything looks delicious and this soup immediately caught my eye. I think it was the cornmeal + milk to thicken up this soup and make a creamy base with a unique texture and hearty, warmth to it. I think you’ll love it, too! Bring a large pot of water to boil. Add the chicken breasts and cook for 15-20 minutes or until cooked through and no pink remains. Drain water; allow chicken to cool. When cool, shred with two forks and set aside. Combine the cornmeal and milk in a small bowl and set aside. Melt the butter in a large pot over medium high heat. 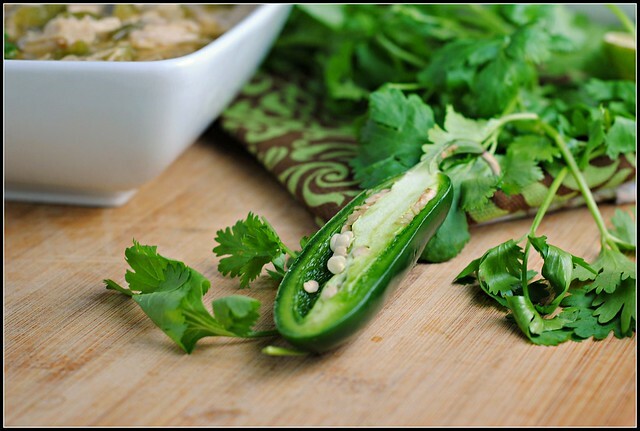 Add the bell peppers, onions, and jalapenos and sauté until soft, about 6-8 minutes. 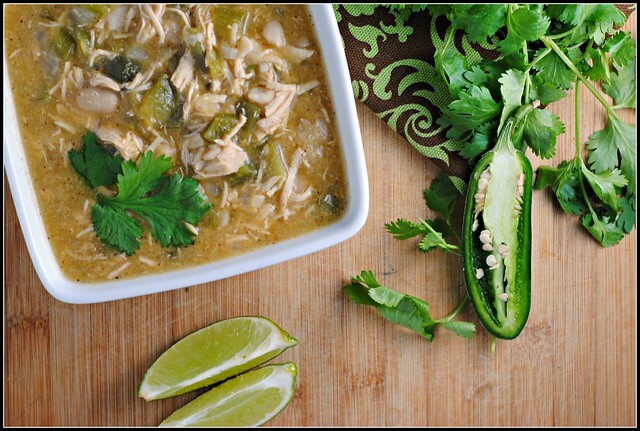 Add the green chiles, beans, broth, spices and salt, and shredded chicken to the pot. Stir to combine and bring to a low boil. Cover and simmer for 20-30 minutes. Result: Full of chicken, this chili is light and yet very thick and filling. I love the simple ingredient list and wholesomeness. The recipe is carbohydrate-controlled, low in fat, moderate in sodium, and high in both fiber and protein. Enjoy! It really has been a great 2013 for you! So many good things! 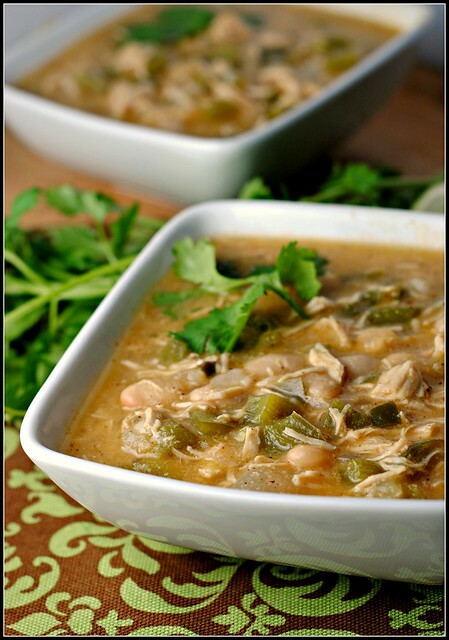 I love the idea of a white chicken chili! I usually make the more traditional chili and this is such a delicious spin! Ohhhh I love chili, and a white chili seems so apropos for a New Year. You had such a great year. It’s so great to see dreams come true. You should be so proud of yourself. I had no idea you were in Michigan. I’m across the border in a town just outside Windsor. Small world. Love this chili. 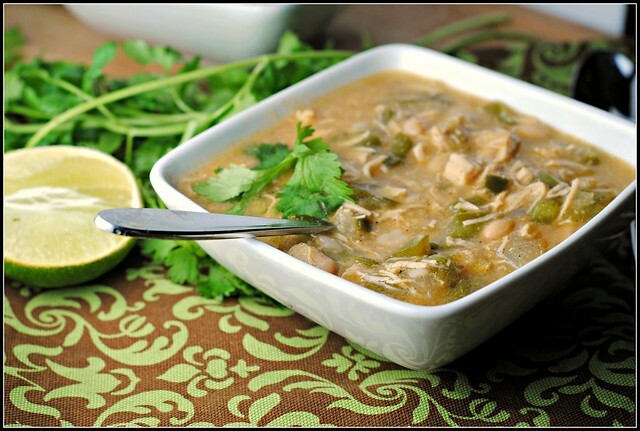 I tend to go beef and I need to open my mind and try some chicken chili. This is perfect. Small world! Thank you so much, Kim. 2012 was a fabulous year – I am proud and very grateful, indeed! Cheers! 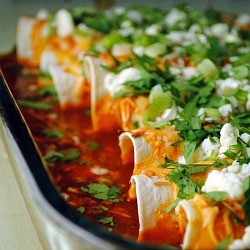 I found this recipe through food gawker and made it last night. Turned out just perfect! Thanks for sharing it with us! I think the carbs and the fiber or reversed. Beans have a lot of carbs in them..
Marty: I believe you may have misread. There are 29.0 grams of carbohydrate and 8.3 grams of fiber. your are correct I did.. sorry..